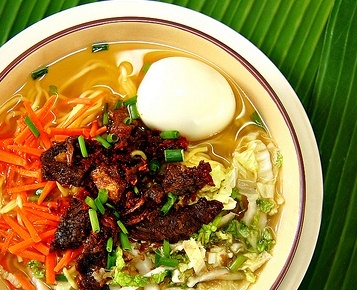 Beef Mami is one of the cheapest all-in-one soup meals Filipinos make. Anyone who wants a hearty, affordable, filling soup stew turns to Beef Mami. This is a very versatile type of soup stew. One can find it in Manila sold as street food, in cafeterias, fast food restaurants or and almost any Filipino home, anywhere in the world. 1 Crush the garlic.Chop the onion. 2 Put the oil in a cooking pot and apply heat. Saute one part garlic. Add the onion. 3 Put in the beef brisket and cook both sides until brown. Add the chicken cube. 4 Pour in the water and bring to a boil.Boil the beef until it becomes tender (about 3 hours on low heat). Add salt and pepper to the boiling water to taste. 5 Boil 2 eggs until hard boiled. 6 In a large pot , boil water. Add egg noodles to the boiling water and cook for about 3 mins. 7 Slice chinese cabbage into 1/2 centimeters thick. 8 On a bowl add cooked egg noodles and the chinese cabbage. 9 Add the beef brisket to the bowl and the soup. 10 On a non stick pan, put the 2 tbsp cooking oil. Add the remaining garlic and cook until it’s golden brown. 11 Slice spring onions thinly. Sprinkle the spring onions and browned garlic on top.